Now that the much heralded day of May 10 has gone by, when we have been made aware of the new offerings form Leica, we are beginning to see more and more opinions and evaluations of the new Leica products. Especially the new Leica M Monochrome is getting a lot of attention, deservedly so. I have yet to see any evaluations and realistic tests, uneducated opinions none withstanding, that are not expressing absolute awe over the performance of that camera. I have not yet had a chance to shoot with it on my own. Subsequently my input has to be based on that of others. But it is not premature to say that there is little, if anything, on the market that comes even close to the M9-M in terms of black and white performance and yes, even price. The Red Dot Forum just released an evaluation and test report on the camera with numerous examples at http://www.reddotforum.com/?gclid=CMaSr52Dq68CFY0BQAod-1wwaA. Individual opinions are one thing, but ultimately it is the results that count. The image examples shown, especially if one takes into account the short comings of out computer monitor screens, are breath taking. What is really amazing is the camera performance at ISO 10,000. I venture to say that currently, there is no camera on the market that even comes close to the Leica M9 M at these ISO settings. Add to that the fact that the M9 M can be used with super-fast lenses across the board, including the incomparable Noctilux 50mm f/0.95, and you have an available light camera system that is without equal. Take a look for yourself. With all the often heard criticism of Leica pricing, here is an example where you definitely get what you pay for. The M9-M is without competition! 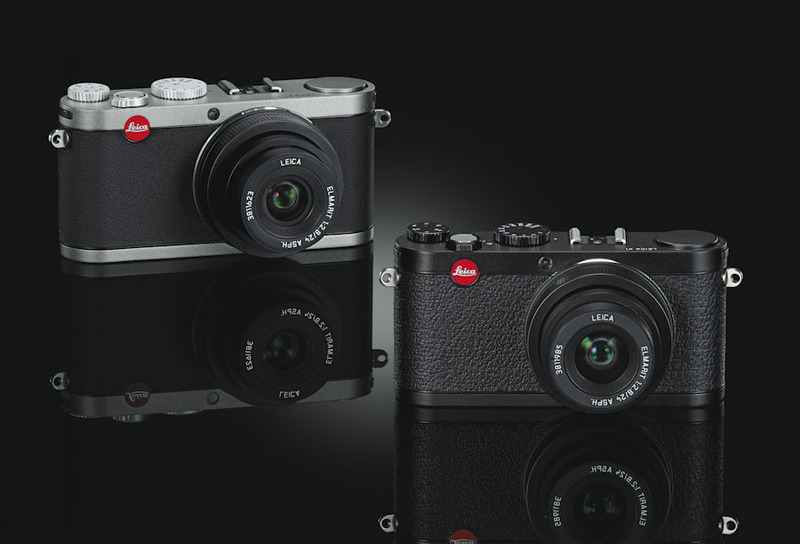 The Leica X1 and the D-Lux 4 have officially been discontinued by Leica as have been any accessories for both cameras. 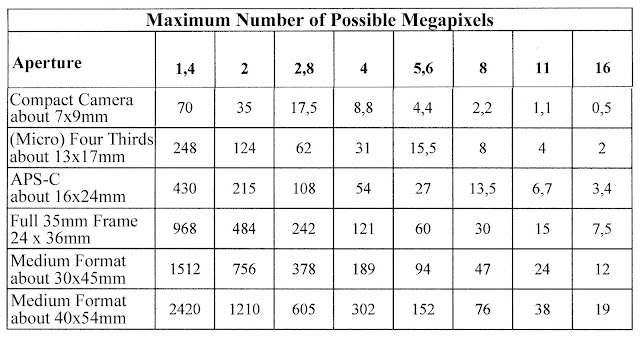 THE MEGAPIXEL RACE - ARE THERE LIMITS? 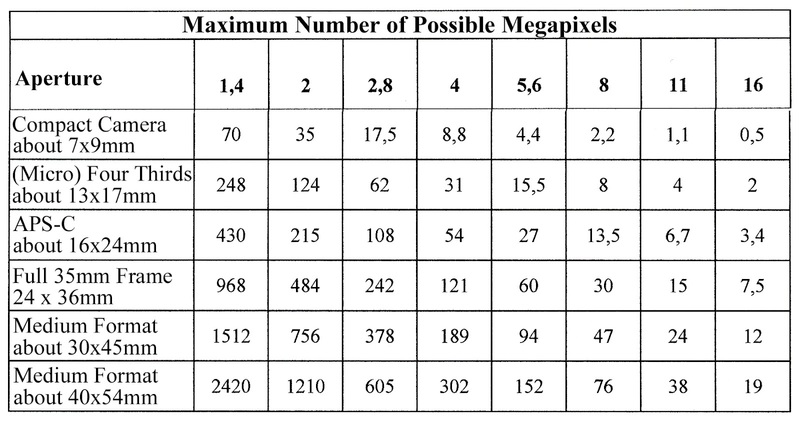 Most people are under the mistaken impression that the higher the megapixel count in a camera, the better the performance. Even though it may appear to defy logic, this isn’t the case at all. Any optical system, even a theoretical one that is made without any optical aberration or other faults has a performance limit. Even the most accurately made lenses have an absolute limit: the light. To demonstrate what this means, here are several photographic examples. 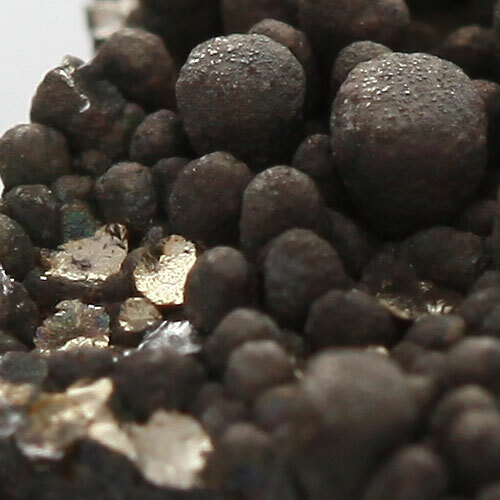 The photograph shows 99.99% pure manganese chips, oxidized in air. For scale a cube with a one centimeter base length is included. All photos by Heinrich Pniok. The cropped images show an exact area of 500 x 500 pixels of the entire image of 5616 x 3744 pixels. We also must not forget camera movement. Without a tripod, these figures are reduced by another 25% at a shutter speed of 1/125 sec. Of course this increases noticeably with longer exposure times. This is an extreme example which shows the image deterioration quite well. However, we must also consider the increase of depth of field with smaller apertures. At times this might be more important and subsequently deliver an overall better image, even with the overall image deterioration associated with small apertures. This brings us to Leica lenses in particular. Since theoretical resolution is highest at the largest aperture of a lens, it makes sense to use lenses which do offer good performance at those apertures. In this regard Leica lenses are unsurpassed. While competitor lenses might come close in performance to their Leica equivalents at smaller apertures, their performance fall off wide open is usually noticeably greater than with their Leica counterparts. For example, the 180mm f/3.4 Apo-Telyt R was specifically designed to offer optimum performance at maximum aperture. There was no appreciable performance increase at smaller apertures. Thus the lens is capable of taking full advantage of the performance increase when used wide open. We should always evaluate a lens by its performance at ALL apertures and not only the ones that result in the best results. It doesn’t make any sense to by a fast f/1.4 lens, for instance, if it requires to be stopped down to f/4 or f/5.6 to deliver adequate results. Wetzlar (sab). Gut vier Tonnen wiegt die Weltkugel, die seit Dienstag auf dem Kreisel am Leitz-Park steht. Und doch ist der Stahl-Globus beinahe sanft an seinen Standort geschwebt. Pünktlich zum Hessentag ist das Kunstwerk, dass die Leitz-Park GmbH der Stadt Wetzlar schenkt, fertig und montiert. Mehr als 1000 kleine und größere Kreise - Symbol für Objektive, wie Leitz-Park-Geschäftsführer Wolfgang Kisselbach erläutert - sind auf der im Durchmesser fünf Meter großen Kugel in Form der verschiedenen Erdteile angeordnet. In Europa, dort, wo Deutschland, genauer Wetzlar, oder noch genauer der Leitz-Park mit dem künftigen Leica-Camera-Standort liegt, ist einer der Kreise Leica-rot eingefärbt. Über eine halbe Million Euro haben der Globus und die Gestaltung des Kreisels gekostet. Beides schenken die Leitz-Park GmbH und Leica-Camera-Aufsichtsratschef Andreas Kaufmann der Stadt Wetzlar. "Wir sind stolz, dass das rechtzeitig zum Hessentag fertig wird", sagt Leitz-Park-Geschäftsführer Kisselbach. "Das wird ein schönes Entree für Wetzlar", erklärt er mit Blick auf die Autofahrer, die von der A 45 über den Kreisel in die Domstadt kommen. An die Autofahrer ist auch bei der Gestaltung der Kugel gedacht worden. Sie ist sandgestrahlt, damit der Stahl nicht in der Sonne glänzt und Autofahrer blendet. Doch dieser Arbeitsschritt kam ganz zum Schluss. Zuvor stand das Design, das maßgeblich von Karin Rehn-Kaufmann stammt und von der Frankfurter Firma Wewer Landschaftsarchitektur umgesetzt wurde. An die Autofahrer ist auch bei der Gestaltung der Kugel gedacht worden. Sie ist sandgestrahlt, damit der Stahl nicht in der Sonne glänzt und Autofahrer blendet. Doch dieser Arbeitsschritt kam ganz zum Schluss. Zuvor stand das Design, das maßgeblich von Karin Rehn-Kaufmann stammt und von der Frankfurter Firma Wewer Landschaftsarchitektur umgesetzt wurde.Gebaut wurde die Kugel in Ludwigshafen durch die Firma Kunstwerk Maudach. Innen ist der Globus hohl, nach dem gleichen Prinzip gebaut, nach dem auch Schiffsrümpfe gefertigt werden, erklärt Geschäftsführer Guenter de Rosa. In zwei Hälften wurde die Kugel nach Wetzlar transportiert und erst vor Ort am "Äquator" zusammen geschweißt. Dann folgte die Sandstrahlung. Bis Dienstagmorgen stand die Kugel eingerüstet neben dem Kreisel. Gegen 9 Uhr legten die Arbeiter los, ein Kran hob den Globus aus dem Gerüst heraus. Und während die Straße aus Sicherheitsgründen gesperrt wurde - der Rückstau reichte bis zur A 45 - hob der Kran die Kugel auf den Kreisel. Beim Herablassen war Zentimeterarbeit gefragt. Denn die Kugel musste auf das vorbereitete Fundament gesetzt und verschraubt werden. Nun wird noch der Boden um das Kunstwerk gepflastert. Am 5. Juni, 15 Uhr, soll alles fertig sein. Denn dann wird Kaufmann den Globus offiziell der Stadt Wetzlar übergeben. liegen, Ist ein Kreis Leica-rot eingefärbt. It dispels the criticism Leica often receives for their pricing policies. It shows that Leica, just like everyone else, has to follow economic principles to be a viable company. However, what is hardly touched on at all is the fact that Leica’s production methods are different from virtually any other camera or lens manufacturer. It is a fact that Leica does not mass produce any of their items. This is necessary to be able to reach the performance levels of their equipment. No mass production will ever be able to match the overall tolerances applied to Leica cameras and lenses. Yet it is those tolerances that are necessary to elevate overall performance to optimum levels. It is often said that Leica cameras and lenses are hand-made. That is misleading. Leica uses a bench made process where individual manufacturing and assembly steps are done by individuals on separate desks or benches. This enables each manufacturing and assembly step to be immediately accompanied by a test. Only if this test proves the manufacturing or assembly step to be within set tolerances is the item allowed to advance to the next step. If not, the necessary corrections are made or, if that is not possible, the item is rejected. This is considerably beyond mass production where applied tolerances are necessarily lower and only periodic spot checks are done. I have personally witnessed these procedures at the Leica plants I have visited. 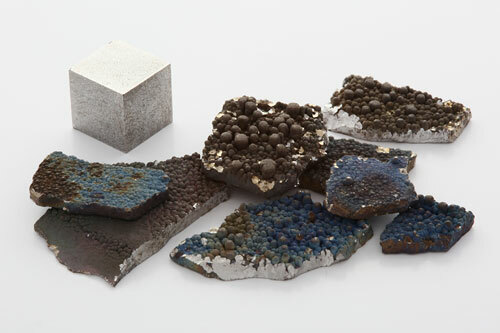 For instance, lens manufacturing starts with the grinding of individual lens elements. Only one element is ground at a time. This starts with a blank disc which is inserted into the grinding machine. The first few steps are automated. All individual grinding steps are done with different machines. Once a step is completed, the lens element is moved to the next grinding machine by a technician. After the third or fourth step the lens element is checked for accuracy and, if necessary, additional grinding is done before the lens element is moved to the next step. This continues throughout the entire grinding and polishing process. The criteria checked are sphericity, the accuracy of the lens surface curvatures, centering, and lens element thickness, just to mention some of the most important ones. Once a lens element has passed all of these steps and once they are thoroughly cleaned, they are coated with the anti reflection coating. To my knowledge, only Leica considers this as part of the manufacturing steps. With other words, the thickness of the coating, which is only in the range of a few molecules, is included in the measurements for lens element thickness and sphericity. Once finished, the lens elements are optically tested to assure that they are within proper optical tolerances. In addition, any allowable deviances from the ideal are recorded by a 0 or a +/- designation of for example -3 or +3. The elements are sorted accordingly. 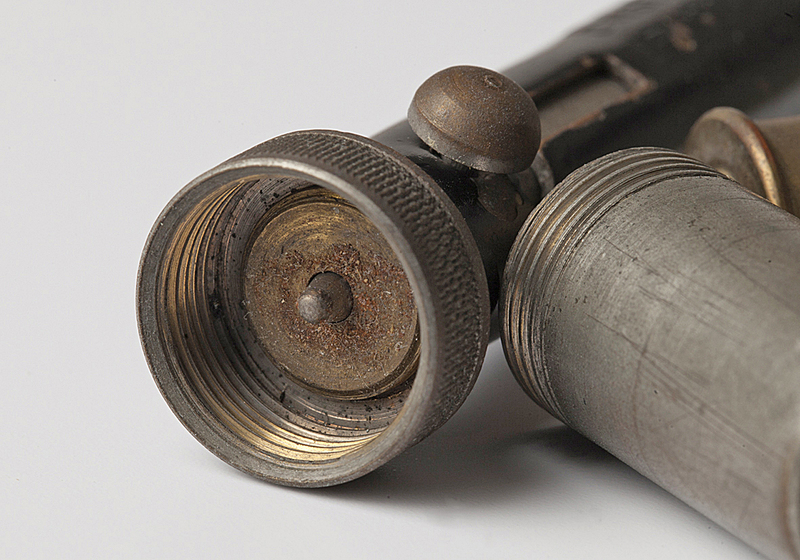 The mechanical parts of the lenses are made along the same guide lines. Each manufacturing step is immediately accompanied by a check and the correction of any deviances if necessary. For instance, I observed a part of a lens being made on a small lace. The test apparently proved that not all was within tolerances, and the lens part was further worked on. This went back and forth several times until all was perfect. Not until then did work proceed to the next item. During the assembly of a lens individual lens elements are not assembled at random. Instead the deviances of individual elements from the ideal are compensated for with other elements with similar deviances. For instance, a +3 element might be paired with a -3 one. It should be noted here that all these deviances have to be within the extreme tolerances set by Leitz. The end result of all this precision is generally lenses with a noticeably higher performance than those from competitors, but also substantially lower performance differences from lens to lens. The manufacture of Leica cameras follows the same principles. Needless to say, such attention to detail and precision does come at a price. If these higher prices for Leica cameras and lenses are worthwhile is something that everyone has to decide for him or herself. However, these steps are necessary to set Leica apart from the crowd, so to speak. Leica 1/100 mm (1/2540 inch), general industry standard 1/1000 to 1/1500 inch. Accuracy of refractive index of glass: Leica standard +/- 0.0002%, international standard +/-0.001%. Accuracy of Abbe number (dispersion): Leica standard +/- 0.2%, international standard +/- 0.8%. For the manufacture of individual lens elements Leica allows production tolerance of no more than ¼ lambda or ¼ of the average wavelength of light which corresponds to approximately 0.00015mm. (0.000005906 inch). International standards are ½ lambda or 0.0003mm (0.00001181 inch). A lot has been said about the new Leica M Monochrom and, as usual, opinions differ. However, one fact has emerged that cannot be argued. The performance of the new camera is quite amazing. Even though the sensor of the camera has the same 18 megapixel resolution as the M9 and M9-P, overall sharpness and tonal range is visibly better. How is that possible? The main difference lies in the fact that the Leica M Monochrom sensor is strictly black and white. Just as with the M9 sensor, the manufacturer is Truesense, the former sensor division of Kodak. Color sensors need to employ a lot of tricks and compromises in order to deliver a color image with full resolution. In front the sensor requires the installation of a screen of color filters. Each pixel is covered by either a red, green or blue filter. Subsequently each pixel records only the color values of that particular filter. In order for each pixel to generate all colors, the missing colors are transferred from the surrounding pixels by interpolation. The image processor of the camera then has to find a compromise between resolution, noise and interpolation artifacts. All these steps adversely affect resolution, sensitivity and indirectly, noise. 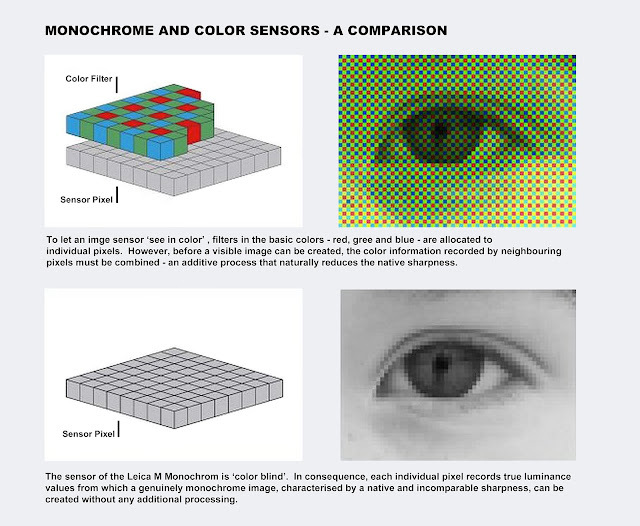 Since a monochrome sensor doesn’t have to deliver color values, the filter screen is unnecessary and image information is generated without interpolation and its subsequent compromises. This enables the sensor to deliver full resolution. Even though the sensor of the Leica M Monochrom has the same 18 megapixel resolution as the M9, it is capable of noticeably better performance. Higher resolution and detail sharpness through the elimination of interpolation, higher sensitivity and less noise because no light is absorbed by the filters. Additional advantages are no need to white balance. Instead the image files can be directly recorded as toned black and white images in varying amounts. Available are blue, selenium and sepia. The entire range of ISO values has been shifted. The maximum ISO value is 10,000, compared to 2,500 with the M9. Minimum ISO value is 160. However, that is considered a ‘pull value’ which results in lowered contrast. For optimum results Leica recommends ISO 320. Following are images taken with the Leica M Monochrom. The detail of the wall is achieved without any further manipulation. The point-like structures of the plant are resolved at individual pixel level. Even the surface of the water shows no noise at all. Lightened to show the incredible amount of detail maintained in the shadows. 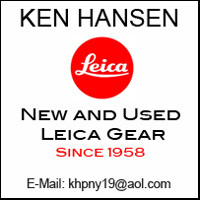 Support of the recently introduced Leica Hasselblad adapter Leica S-Adapter-H. Improvement of flash synchronization with focal-plane shutter at 1/125 sec. Die erste digitale Schwarzweiß-Kamera im Kleinbildformat! Unser Admin Andreas, der auch das Leica-Forum betreibt, konnte schon vor der offiziellen Vorstellung einen Prototypen testen und daher gehen wir in diesem Artikel der Frage nach, ob eine derartige Kamera überhaupt sinnvoll ist und für welche Käufer sie interessant sein könnten. Auf der Rückseite der LEICA M MONOCHROM finden sich alle Bedienelemente, wie von der Leica M9 und M9-P gewohnt. Die LEICA M MONOCHROM gibt es nur in schwarzchrom, während die M9-P die Auswahl zwischen schwarz lackiert und silbern verchromt lässt. Auch auf der Oberseite der Deckkappe findet sich keinerlei Gravur, nur im Blitzschuh ist der Schriftzug “MONOCHROM” dezent sichtbar. 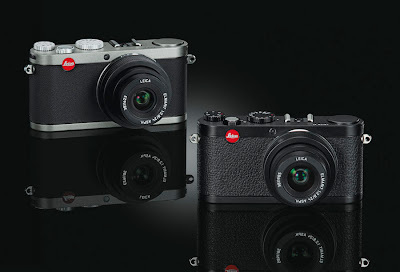 Der Lieferumfang entspricht im Wesentlichen der LEICA M9-P, als Software wird ebenfalls Adobe Lightroom ausgeliefert. Hinzu kommt lediglich ein Trageriemen und eine Lizenz für NIK Silverefex 2, eine Software speziell zur Erzeugung und Nachbearbeitung von Schwarzweißbildern. Als spezielles Schmankerl für MONOCHROM Kunden bietet Leica in Kooperation mit Whitewall einen speziellen Service an: Nach der Registrierung auf der Leica Homepage erhalten sie einen eigenen Zugang bei Whitewall und können Ihre Bilder auf Baryt-Papier ausbelichten lassen. Einige Punkte wie Weißabgleich und Farbraum entfallen logischerweise, weil Farbe keine Rolle spielt. Speziell für die SW Fotografie kommen einige Punkte dazu: Die JPEGs der Kamera lassen sich direkt in verschiedenen Tönungen und Stärken einfärben, zur Auswahl stehen Blau, Selen und Sepia. Der maximale Wert liegt jetzt bei ISO 10.000 – bei der M9 ist bei ISO 2.500 Schluss. Die Skala beginnt jetzt bei ISO160 – dies ist aber schon die Pull Einstellung, die einen reduzierten Kontrastumfang hat. Als optimalen Wert empfiehlt Leica ISO320. Um den kompletten Kontrastumfang des Sensors auszuschöpfen, stellt das optional einblendbare Histogramm die Verteilung der unbearbeiteten RAW-Daten dar, die durch keinen Kamera-internen Prozess verfälscht wurden. Die Clipping-Anzeige, um ausgefressene Lichter und Schatten ohne Zeichnung zu finden, lässt sich individuell einstellen, so dass die generierten DNG-Files das Optimum an Grauwerten enthalten. 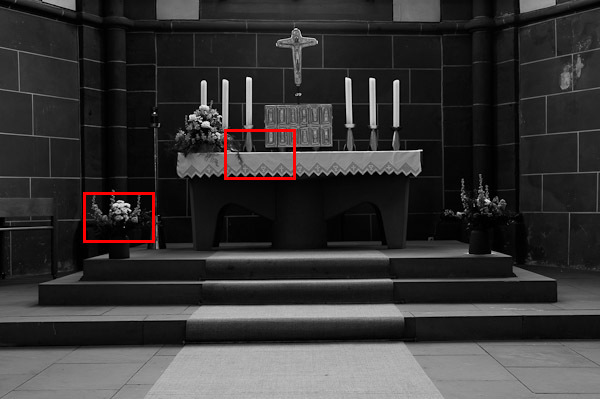 Das wichtigste Unterscheidungsmerkmal der LEICA M MONOCHROM liegt im reinen Schwarzweiß-Sensor. Er stammt wie der M9 Sensor auch von Truesense, der ehemaligen Sensorsparte von Kodak. Ein bisschen Hintergrund, um die Vorteile des Sensors zu erklären: Farbsensoren müssen eine Menge Tricks und Kniffe anwenden und Kompromisse eingehen, um ein Farbbild in voller Auflösung zu liefern. All diese Schritte gehen auf Kosten der Detailauflösung, der Empfindlichkeit und damit indirekt des Rauschverhaltens. Ob das nur blasse Theorie ist oder sich tatsächlich Unterschiede im Bild zeigen, haben wir in der Praxis getestet. Hier zwei Beispielbilder, um die Detail-Auflösung zu beurteilen. Diese Außenansicht im Kunstmuseum Bonn benutzen wir gerne, um die Auflösung von Kameras zu testen. Details werden pixelgenau aufgelöst – ohne Nachschärfen oder Überschwinger, wie man an der Jalousie erkennen kann. In diesem Detail aus der Mauer sieht man perfekte Details ohne Manipulation am Bild. Ein anderes Motiv aus dem Botanischen Garten – auf den ersten Blick wirkt es wie aus dem Elektronenmikroskop. Hier sind es punktförmige Strukturen auf den Pflanzen, die wirklich Pixel für Pixel aufgelöst sind. Die theoretisch höhere Detailauflösung bestätigt sich also voll in der Praxis – beim nächsten Bilde haben wir die Empfindlichkeit aufgedreht. Um zu testen, wie sich extreme ISO Werte auf das Bild auswirken, haben wir am Rheinufer einige Testaufnahmen abends gegen 21 Uhr bei hohen ISO Werten gemacht. Diese Mauer habe ich mit ISO 8.000 fotografiert. Details aus einer dunklen Partie rechts im Blattwerk zeigen zwar deutliches Rauschen, aber kleine Details der Efeublätter werden noch aufgelöst. Das Rheinpanorama wurde mit ISO 3.200 gemacht. Auch in der Wasserfläche ist kein Rauschen zu sehen. Mein Fazit zur Empfindlichkeit: Die Monochrom kann bis ISO 3.200 ohne Einschränkung genutzt werden, selbst bei ISO 8.000 liefert sie noch wirklich gute Ergebnisse. Was für Kontrastumfang in den Leica M Monochrom DNGs steckt, lässt sich an diesem Bild aus dem Botanischen Garten zeigen. Das JPEG aus der Kamera ist für meinen Geschmack deutlich zu dunkel und sieht so aus, als ob die Schatten absaufen (das kann gut an der Beta-Firmware 0.009 liegen). Aus dem entsprechenden DNG haben wir zwei Varianten generiert. Variante 1 zeigt das Bild aus, wie ich es gerne hätte. Variante 2 zeigt, was in den Schatten noch alles drinsteckt: Sowohl in der Schattenpartie neben der Tonne als auch unterhalb ist noch jede Menge Information drin. Angesichts dieser Leistungen geht sicher kaum noch einer davon aus, dass es bei Leica eine Kamera ohne Farbe auch für einen kleineren Preis gibt: Die LEICA M MONOCHROM schlägt auf den Preis einer M9-P etwas drauf und wird für 6.800 € in den Laden kommen. So weit die technischen Werte und Leistungen der neuen Kamera – bleibt die Frage: Wie verändert sich die Arbeitsweise mit der LEICA M MONOCHROM? Leica hat schon immer eine andere Produktphilosophie verfolgt: ”Konzentration auf das Wesentliche“. Der Fotograf war mit einer Leica M schon immer dazu gezwungen, sich während der Aufnahme Gedanken zu machen. Die Leica Monochrom treibt dieses Prinzip auf die Spitze: Autofokus und Programmautomatik gibt es sowieso nicht. Jetzt muss auch das spätere Schwarzweißbild bei der Aufnahme gestaltet werden. Ohne die Farbinformation im Bild kann später am Computer nicht mehr mit dem “digitalen Rotfilter” oder “Pseudo-Infrarot” das Bild dramatisiert werden. Lediglich die Mittel der klassischen Schwarzweiß-Dunkelkammer stehen noch zur Verfügung. Wer sich aber auf diese Art zu arbeiten einlässt, wird mit einer kompromisslosen Qualität belohnt. Für den stolzen Preis von 6.800 € bekommt der Käufer einen echten technischen Leckerbissen: In ihrer Spezialdisziplin Schwarzweiß liefert die LEICA M MONOCHROM in Schärfe, Dynamik und Rauschverhalten fantastische Ergebnisse. Und als letzte Frage: Für wen ist diese Kamera interessant? Wer bereit ist, für eine Kamera 6.800 Euro zu zahlen, hauptsächlich in Schwarzweiß fotografiert und auf der Suche nach kompromissloser Qualität ist – für diese Zielgruppe könnte die LEICA M MONOCHROM die perfekte Kamera sein. Im professionellen Bereich sind es vielleicht Reportage-Fotografen, für die die Qualität und bessere High ISO Performance den Unterschied macht, um auch unter schwierigsten Lichtverhältnissen noch gute Ergebnisse zu erzielen. Leica Camera Ltd has unveiled the latest developments in its premium retail concept in the heart of Mayfair, London W1, with the expansion of its premises in Bruton Place, designed to provide a unique and personal experience to Leica customers. Incorporating three buildings, Leica is set to have a major presence in Bruton Place with an array of new facilities. The Leica Store Mayfair (opened in September 2009) at 34 Bruton Place will continue to display and offer the entire range of Leica products. Above the store, the current Leica Akademie training facility has been expanded to encompass a second Akademie space, allowing the company to offer a wider range of training workshops, one-to-one product demonstrations, advice sessions and private consultations for its customers. In addition, Leica has opened a dedicated Media Centre, where members of the media will be able to hold meetings and interviews with Leica representatives. It is immediately opposite the store, however, that the most significant changes are taking place. The customer experience will start at street level with a complimentary café for Leica owners on the ground floor of no. 27, a three-storey building. The informal and relaxed atmosphere of this café bar will allow the Leica Client Care team to provide personal user advice and assistance in a unique environment. Adjacent to this is a dedicated glass-partitioned laboratory, where light repairs and sensor cleaning will be undertaken. Venturing further into the ground floor of the new building, customers will find a new rental service for the Leica S2, named Rental-S, providing equipment to some of the most influential international professional photographers. On the first floor of 25 Bruton Place, in addition to support services, will be a gallery displaying images created using Leica cameras. This gallery can be accessed directly from 27 Bruton Place. Perhaps the most surprising development awaits the visitor on the second floor, where Leica has transformed the entire space into a discreet professional photographic studio, called Studio-S.
Studio-S is available to hire exclusively to photographers using the Leica S-System, and will include changing and make-up areas, hospitality and digital operator facilities. The studio will be ideally located and appropriate for high-profile or confidential shoots. As well as on-site equipment, Leica is offering additional support such as Leica-trained photographic assistants, therefore providing a unique hire package. Bruton Place is located in the centre of Mayfair between Old Bond Street and Berkeley Square. For more information on the Leica Store Mayfair, and all Leica products and services in the UK, please visit www.leica-storemayfair.co.uk. Die Existence Blitz Kapseln wurden als epochale Erfindung angeboten. Sie boten einen großen Fortschritt in dem Gebrauch von Blitzpulver, waren aber weit entfernt von der Bequemlichkeit von eingebauten elctronischen Blitzgeräten. The first Leica with built-in flash synch was the Leica IIIf. That, however, does not mean that flash photography was impossible before that. Leitz, as well as some other manufacturers used to make add-on flash synch devices for Leicas prior to the IIIf. However, these would only function with flash bulbs or electronic flash. What about flash photography prior to flash bulbs? Enter flash powder. This was one of the earliest means to add a bright, instant light source to photography. In 1887, Adolf Miethe and Johannes Gaedicke mixed fine magnesium powder with potassium chlorate to produce Blitzlicht. This was the first ever widely used flash powder. Blitzlicht gave the photographers the ability to produce instant photographs at night at a very high shutter speed. This caused quite an excitement in the photography world. 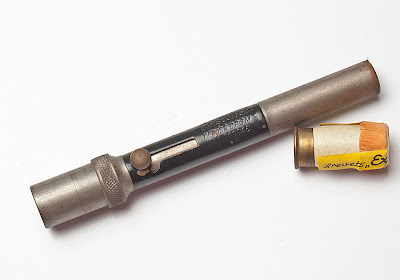 Most “flash attachments” for flash powder were nothing more than hand held devices that required to be “loaded” with a small amount of the flash powder which then would be triggered with a flint, not unlike the flints used to light old-style fuel powered cigarette lighters. 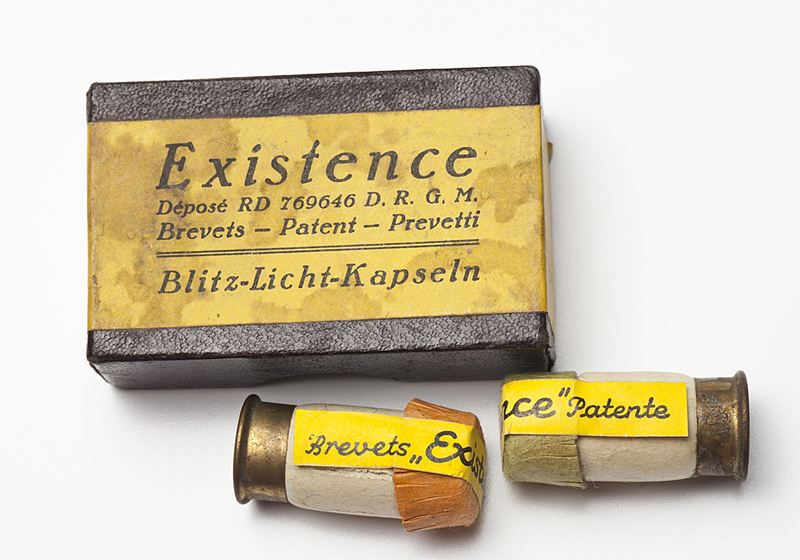 A much more convenient way was offered by the Existence Blitz Kapsel (Existence Flash Capsule). 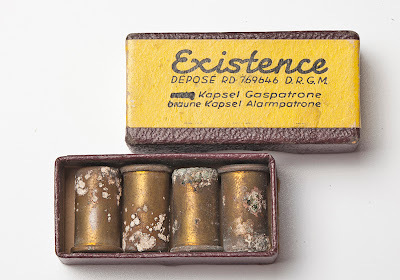 They consisted of cartridges filled with a fixed amount of flash powder which in turn were triggered by a small primer as used for gun bullets. The cartridges were inserted into a hand-held device with a trigger pin. 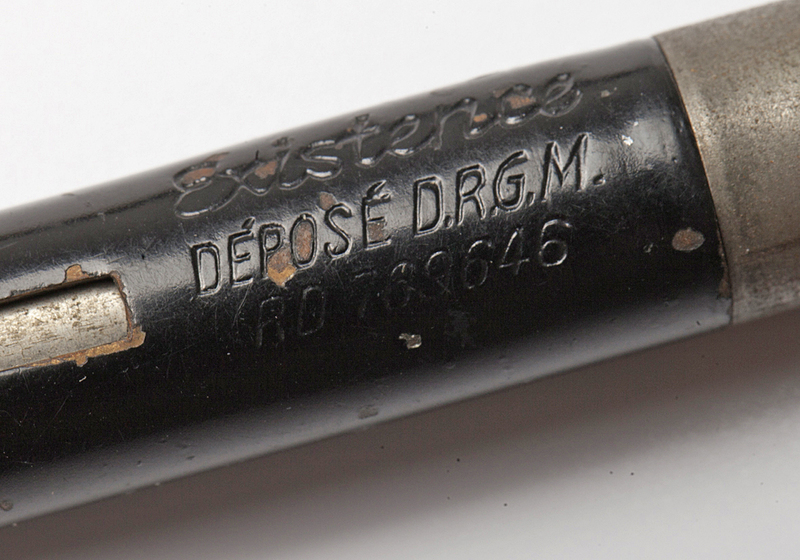 When released, the trigger pin would strike the primer which then ignited the flash powder cartridge. 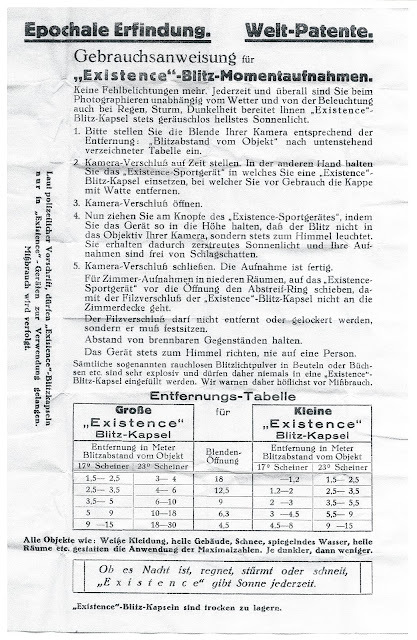 The Existence Blitz Kapel was offered in two different sizes, a große (large) and a kleine (small) one. The Große Existence Blitz Kapsel was good for distances of 18 to 30 meters (60 to 100 feet) at f/4.5 for films with a sensitivity of 23 degree Scheiner (ASA/ISO 16). The Kleine Existence Blitz Kapsel had a range of 9 to 15 meters (30 to 50 feet) at the same aperture and film speed. Those figure indicate a considerable brightness. That allowed the company to use the slogan “Ob es Nacht ist, stürmt oder schneit, Existence gibt Sonne jederzeit.” (Whether night, storm or snow, Existence offers sun anytime) Not a bad start for flash photography, yet a long ways from the convenience of built-in flash.